My Clean School is a network of schools committed to empowering students. It promotes opportunities for action and it rewards people and organization that contribute to the spirit of My Clean. It performs as being the wind beneath their wings – supporting others. In a sense we provide the My Clean School generate what we call the space for students and organization to be in action and to be acknowledged for what they do. My Clean School supports the view that the neglect of our environment and its expressions in the streets is simply a symptom of low or missing community spirit, of feeling dis-empowered. It empowers students of each school to take the initiative and to own the outcome of whatever steps they may take. 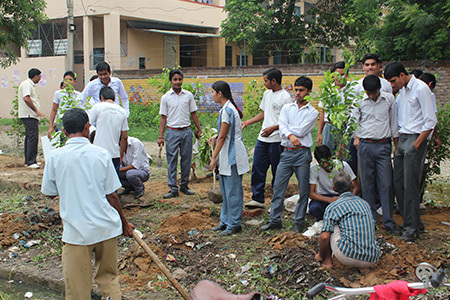 For students, My Clean India provides opportunities for practicing leadership. My Clean School is simply responding to the United Nations call (Agenda 21, Ch.25) for the participation of youth in creating a sustainable environment with the wider community. It is a common journey to be that change and that applies to them as much as to us. We simply create that freedom to be that, and as we are discovering with the youth of today, to change their lives including even ourselves in the process. The youth choose (with guidance) what action to take and then own the outcomes of their initiatives. Promote Appreciative Inquiry, which looks at what is working and then builds on that. One could say, the spirit of My Clean discovers seeds and nurtures them (displacing the weeds). A key feature is therefore the acknowledgment of others, including businesses who make a contribution to a cleaner environment.Students may also practice Progressive Inquiry which is looking at what is not working, what it could look like and how it could become better.